The tall tale of Paul Bunyan and his blue ox Babe first appeared in the Detroit News-Tribune in 1910, based on stories originating from Midwestern logging camps. The heroic lumberjack soon became a nationally recognized icon and a fitting subject for an artist in search of a new and typically American subject matter. 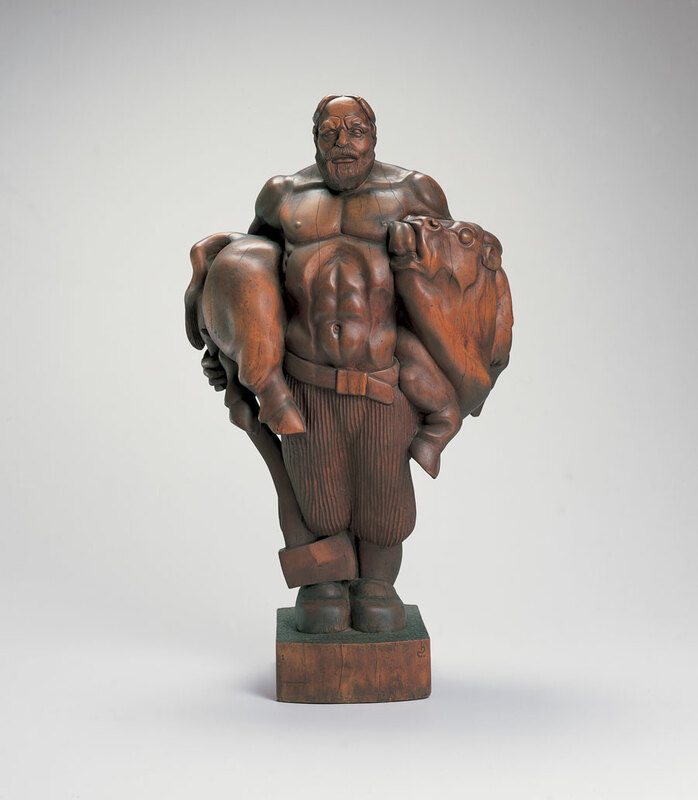 Carroll Barnes, who had once worked as a lumber-packer, sculpted his robust figure of Paul Bunyan shortly before enrolling at Cranbrook Academy of Art to study with Resident Sculptor Carl Milles. Although expert at carving materials as diverse as stone and Lucite, Barnes’s greatest affinity was for wood, a material particularly appropriate for subjects like Bunyan and Johnny Appleseed, whom he also sculpted. After settling into a studio near Sequoia National Forest in 1941, Barnes embarked on a 16 ½-foot-tall version of Paul Bunyan, a project which, interrupted by service in the Army, preoccupied him for seven years. Carved from a 2,000-year-old Redwood tree, the mammoth statue gained distinction as the world’s largest wood carving and earned Barnes a legendary status among sculptors.